Java class for FindMailStoreUsersResultType complex type. Gets the value of the findMailStoreUsersReturnStatus property. Gets the value of the mailStoreUserSearchResult property. 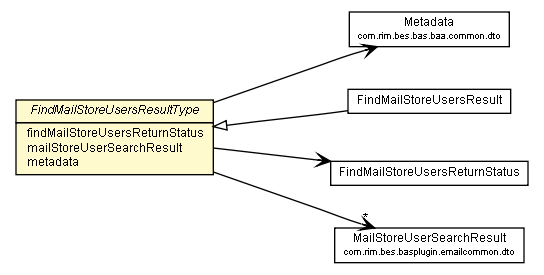 Sets the value of the findMailStoreUsersReturnStatus property. This accessor method returns a reference to the live list, not a snapshot. Therefore any modification you make to the returned list will be present inside the JAXB object. This is why there is not a set method for the mailStoreUserSearchResult property.